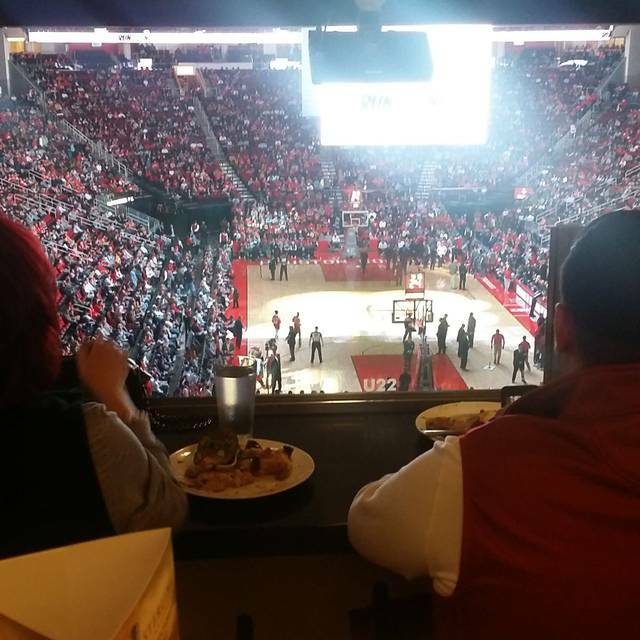 Red & White Wine Bistro is open for Rockets' games & other select Toyota Center events. Please call for details. Can't find a time slot you want? Call the restaurnat and see if we have any availability in our VIP banquet room? Tundra garage is adjacent to the Toyota Center as are several public garages & "park & lock" lots near the arena. Red & White Wine Bistro offers a private banquet room accommodating up to 250 guests. 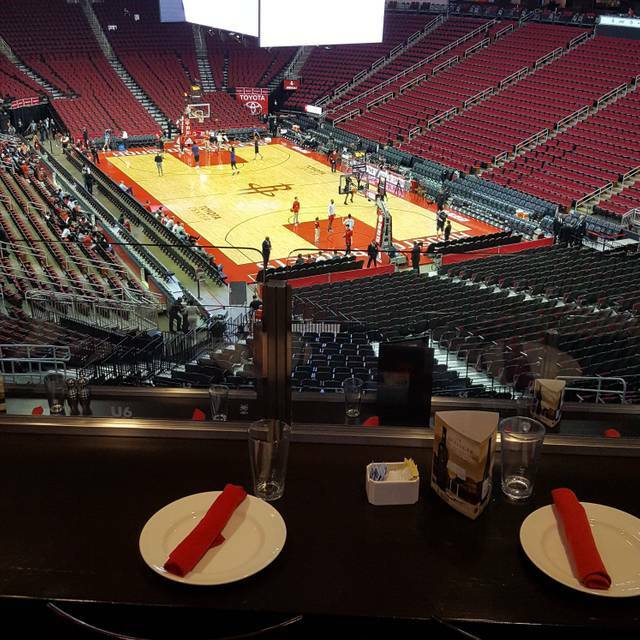 The Sterling Vineyards Red & White Wine Bistro at the Toyota Center is the perfect place to watch your Houston Rockets while enjoying some of the city’s finest cuisine. Every game night, we create a spectacular “Chef’s Table” buffet featuring a variety of cuisines from Levy Restaurants with features from the Landry’s Group of restaurants, all for just $42.95 per adult. Kids ages 6 through 12 eat for only $19.95. Our full bar is flanked by two wine towers offering a robust selection of popular wines and an extensive assortment of liquor and beer. Conveniently located on the arena’s lower suite level on the south side of the arena, just below the Toyota Tundra parking garages’ Sky Bridge, The Sterling Vineyards Red & White Wine Bistro offers a unique and affordable dining experience for Rocket’s fans! The evening was wonderful. The food was awesome. We ate so much, but had room for the carrot cake and those big cookies! Food was delicious, many choices, I had the short ribs and they were cooked perfectly -they fell apart and the Brussels sprouts were delicious also. Great experience. Red and White Bistro was good as usual. This was a business dinner, so it was important to impress. I reserved ahead of time and got the table I asked for. The food is great,such a wide variety for everyone, including the kids! Also wait staff are always on point! Great date night! Watching the game and eating great food - no better experience. I would definitely dine there again! I had read numerous profiles of poor service, along with great service. The poor service was more accurate. That said, the food is amazing. I absolutely loved the prime rib and went back so many times that I unfortunately over ate and paid the price later--my bad. We arrived early of our 6:30 reservation, but could not get a good seat overlooking the floor. All I can say is the food is amazing and the choices were more numerous than I can mention. They need more staff to serve or make adjustment on the staff--look out for Harold, he's nice but gone most of the time. Great for a special night at the game!!! We love the relaxed feel of Red & White Bistro – it's like a comfortable dining room in a friends home. We definitely will return to try more dishes. The flat breads were amazing and the salads were all very refreshing. My husband loved the griled spicy shrimp and i loved the steak, mashed potatoes and grilled vegetables. We both loved the carrot cake, ice cream and those big cookies (chocolate chip and oatmeat)! Service was well-timed and our waitress was very friendly. Great food. Enjoyed getting to watch the players shoot around while we ate. prime rib not so good. Great fruits and desserts. Service was just wonderful Enjoyed every bit of it. Red and White is always a hit before a game! I'll eat there again. It took a while to be seated and then where they say us we couldn't even see the game or the screen. I think they seriously need to consider putting TVs throughout the restaurant. Jannell was my server and she treated me like royalty!! I would definitely recommend her services to others! Waited 15 min while plenty of open tables. Did not get table request. Managers walked around doing nothing while the poor hostess who was obviously new or untrained, tried to figure things out. Not worth the cost for sure. Celebrated my birthday at the Red & White Bistro and had an amazing evening. 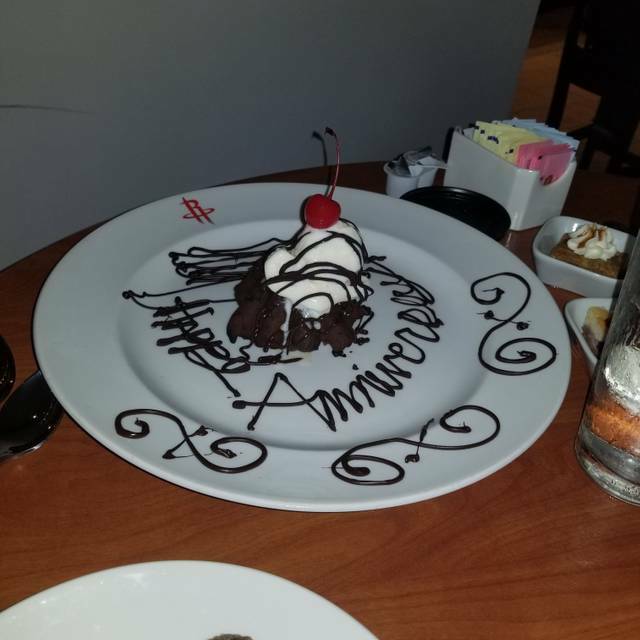 The entire staff was first-class and Kampbell, the manager, ensured we had the perfect evening. I would highly recommend this fun spot for any Rockets fans. This is the best deal at The Toyota Center! $50 for an upscale/luxury "all you can" eat buffet and the food selections are AMAZING. I ate here last night with my in-laws and wife before the Rockets whooped the 76's and we were provided with excellent and prompt service from our server, Nicole. The Garlic Crusted Strip Loin was cooked perfectly and melted in your mouth. The pulled pork taco station was to die for. The grilled vegetables were delicious. The charcuterie station was excellent with salami, prosciutto, and a wide variety of cheeses. Don't even get me started on the desert station; chocolate covered strawberries, mango macaroons, baked cookies, and an ice cream station to top it all off. I always leave this establishment feeling almost uncomfortably full because I cannot seem to stop myself from sampling all their delicious fares. Give this place your business, you will not regret it. Food is on par but the service has always been lacking. OMG! Red and White Wine Bistro is the perfect place if you're looking to impress your guest. The food is delicious, the ambience is classy, the customer service is exceptional. I can't wait to RSVP again. The quality of the food here has decreased. Ribeye roast was very tough. Two in our party had the same reaction to the roast. Many meal/food choices for everyone. But the Large Choc Chip cookies and Oatmeal cookies are the best....So I have to eat $40 of cookies and steak. It's a nice space, good food, awesome bartenders with a nice wine list. Will be back. Not at this point in time. The food served on Sunday night was the worst I have experienced in my 6 or 7 years eating at Red and White. Considering going elsewhere before games. You're greeters need to work on being more knowledgeable about the company they work. Very poor! We were seated in a oveflow side room. Asked for a different table and were told nothing available even though there were empty tables throughout the restaurant. Not accomodating at all. Food was okay.......nothing great. Carved meat was very tough. Disappointed there was only one seafood item on the entire buffet. The best things were the hot dog bar, the pizza, and the big cookies. Overpriced for the quality of the food but of course, convenient for going to a Rockets game. Attended the Houston Rocket game and enjoyed dinner before the game.